Flower Hill, New York, U.S.
Walter Slezak (German pronunciation: [ˌvaltɐ ˈslɛzak]; 3 May 1902 – 21 April 1983) was an Austrian-born character actor and singer who appeared in German films before migrating to the US in 1930 and featuring in numerous Hollywood productions. Slezak often portrayed villains or thugs, most notably the German U-boat captain in Alfred Hitchcock's film Lifeboat (1944), but occasionally he got to play lighter roles, as in The Wonderful World of the Brothers Grimm (1962) and as a wandering gypsy in The Inspector General (1949). He also played a cheerfully corrupt and philosophical private detective in the film noir Born to Kill (1947) and appeared as Squire Trelawney in Treasure Island (1972). Born in Vienna, the son of opera tenor Leo Slezak and Elsa Wertheim, he studied medicine for a time and later worked as a bank teller. His older sister Margarete Slezak was also an actress. He was talked into taking his first role, in the 1922 Austrian film Sodom und Gomorrah, by his friend and the film's director, Michael Curtiz. In his early movie career, before he gained a great deal of weight, Slezak was cast as a thin leading man in silent films. He also acted on the stage for many years, debuting on Broadway in 1931. In Vienna in the 1930s, Slezak was close friends with heiress Maria Altmann and her family. His first American film was Once Upon a Honeymoon (1942), with Ginger Rogers and Cary Grant. He worked steadily and appeared in over 100 films including The Princess and the Pirate (1944), The Spanish Main (1945), Sinbad the Sailor (1947), Born to Kill (1947), Abbott and Costello in the Foreign Legion (1950), People Will Talk (1951), and Call Me Madam (1953). Slezak acted in radio in such shows as Lux Radio Theater, Columbia Workshop, The Pepsodent Show, and The Charlie McCarthy Show. He made numerous television appearances, including in the programs The Loretta Young Show, This Is Show Business, Playhouse 90, and Studio One, and appeared as The Clock King in episodes 45 and 46 of TV series Batman (1966). In the 1970s, Slezak played the non-singing role of Frosch, the jailer, in the San Francisco Opera production of Johann Strauss' operetta Die Fledermaus. Later film roles in Britain included the Cliff Richard vehicle Wonderful Life (1964) and Black Beauty (1971). His autobiography, What Time's the Next Swan? was published in 1962. The book's title refers to an alleged incident in the career of his father, heldentenor Leo Slezak. During a performance in the title role of Lohengrin, the elder Slezak was supposed to finish his aria by stepping into a swan boat and then being pulled offstage. When a stagehand removed the boat prematurely, Slezak supposedly reacted to the error by asking the audience "What Time's the Next Swan?" Slezak married Johanna "Kaasi" Van Rijn on October 10, 1943. The couple had three children: Ingrid, Erika, and Leo. Erika went on to become an Emmy-winning actress, and starred as Victoria Lord on the long-running soap opera One Life to Live from 1971 to its cancellation in 2012. In 1974, Slezak appeared on the series as her character's godfather, Lazlo Braedecker. Grave of Walter Slezak, his wife Johanna and his parents Leo and Elisabeth. On 21 April 1983, Slezak died from a self-inflicted gunshot. He was reportedly despondent over the state of his health, most notably heart trouble, a recent prostate operation, and a shoulder injury requiring several treatments a week. He was buried in the grave of his parents in the cemetery of St. Laurentius Church, Egern. In 1955, Slezak won a Tony Award for his role in the Broadway production of Fanny. ^ a b c d e f g "Turner Classic Movies: Biography for Walter Slezak". TCM.com. Retrieved 17 December 2009. ^ Collins, Gregor (15 August 2012). "The Accidental Caregiver: How I Met, Loved, and Lost Legendary Holocaust Refugee Maria Altmann". Bloch-Bauer Books – via Amazon. ^ "Erika Slezak profile". SoapOperaDigest.com. Retrieved 16 December 2009. ^ ""Die Fledermaus" in S.F." Operawarhorses.com. 16 September 2006. Retrieved 9 March 2012. ^ Trabling, Walt. "Slezak Offers Memoir". Santa Cruz Sentinel. 21 October 1962. Retrieved 18 December 2018. ^ Jones, Jack. "Actor Walter Slezak Shoots Self to Death at New York Home". Los Angeles Times. 23 April 1983. Retrieved 17 December 2018. ^ "WALTER SLEZAK, ACTOR, IS A SUICIDE AT 80 ON L.I." The New York Times. 23 April 1983. ^ Thomas Staedeli, Portrait of the actor Walter Slezak, cyranos.ch; accessed 6 November 2016. ^ "Star | Walter Slezak". kino.de. 21 April 1983. Retrieved 9 March 2012. ^ Associated Press. "Tony Awards Given Lunt and College Trio". San Bernardino Sun. 28 March 1955. Retrieved 18 December 2018. Wikimedia Commons has media related to Walter Slezak. 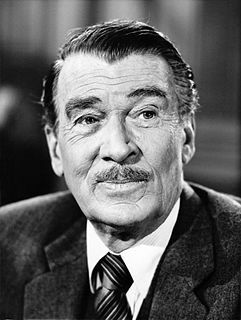 Walter Davis Pidgeon was a Canadian-American actor. He earned two Academy Award for Best Actor nominations for his roles in Mrs. Miniver (1942) and Madame Curie (1943). Pidgeon also starred in many films such as How Green Was My Valley (1941), The Bad and the Beautiful (1952), Forbidden Planet (1956), Voyage to the Bottom of the Sea (1961), Advise & Consent (1962), Funny Girl (1968), and Harry in Your Pocket (1973). Alexander Knox was a Canadian actor on stage, screen, and occasionally television. He was nominated for an Oscar and won a Golden Globe for his performance as Woodrow Wilson in the film Wilson (1944). Erika Alma Hermina Slezak is an American actress, best known for her role as Victoria "Viki" Lord on the American daytime soap opera One Life to Live from 1971 through the television finale in 2012 and again in the online revival in 2013. She is one of the longest-serving serial actors in American media. She won a total of six Daytime Emmy Awards for her portrayal of Viki, the most of any daytime drama actress. Coppélia is a comic ballet originally choreographed by Arthur Saint-Léon to the music of Léo Delibes, with libretto by Charles-Louis-Étienne Nuitter. Nuitter's libretto and mise-en-scène was based upon two stories by E. T. A. Hoffmann: Der Sandmann and Die Puppe. In Greek, κοπελιά means girl, young lady. Coppélia premiered on 25 May 1870 at the Théâtre Impérial l'Opéra, with the 16-year-old Giuseppina Bozzacchi in the principal role of Swanhilda and ballerina Eugénie Fiocre playing the part of Frantz en travestie. The costumes were designed by Paul Lormier and Alfred Albert, the scenery by Charles-Antoine Cambon, and Édouard Desplechin and Jean-Baptiste Lavastre. Henry Byron Warner was an English film and theatre actor. He was popular during the silent era and played Jesus Christ in The King of Kings. In later years, he successfully transitioned into supporting roles and appeared in numerous films directed by Frank Capra. Warner's most notable role to modern audiences is "Mr. Gower" in the perennially shown film It's a Wonderful Life, directed by Capra. He also had a cameo in Sunset Boulevard, directed by Billy Wilder. Mason Adams was an American character actor and voice-over artist. Leo Slezak was a world-famous Moravian tenor. He was associated in particular with Austrian opera as well as the title role in Verdi's Otello. He is the father of actors Walter Slezak and Margarete Slezak and grandfather of the actress Erika Slezak. Ian Keith was an American actor. 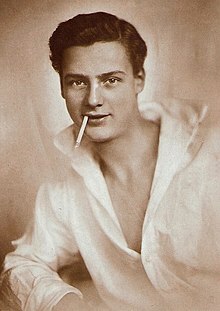 Mathias Wieman was a German stage-performer, silent-and-sound motion picture actor. Walter Fitzgerald Bond was an English character actor. Sodom und Gomorrha: Die Legende von Sünde und Strafe is an Austrian silent epic film from 1922. It was shot on the Laaer Berg, Vienna, as the enormous backdrops specially designed and constructed for the film were too big for the Sievering Studios of the production company, Sascha-Film, in Sievering. The film is distinguished, not so much by the strands of its often opaque plot, as by its status as the largest and most expensive film production in Austrian film history. In the creation of the film between 3,000 and 14,000 performers, extras and crew were employed. Walter Rilla was a German film actor of Jewish descent. He appeared in more than 130 films between 1922 and 1977. He was born in Neunkirchen, Germany and died in Rosenheim, Germany. John Wengraf was an Austrian actor. Reinhold Schünzel was a German actor and director, active in both Germany and the United States. The son of a German father and a Jewish mother, he was born in St. Pauli, the poorest part of Hamburg. Despite being Jewish, Schünzel was allowed by the Nazis to continue making films for several years until he eventually left to live abroad.